It’s a mild Wednesday evening between Christmas and New Year’s, the time of year when half of Washington seems to be away. 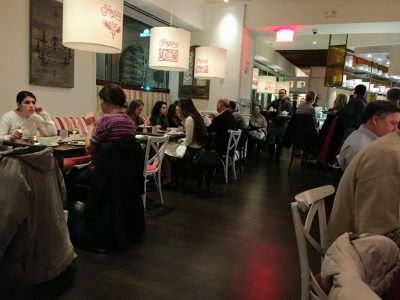 But at Sfoglina — Fabio and Maria Trabocchi’s brand new pasta house in Van Ness — the house is full and the hostess stand is buzzing with patrons waiting for their tables to clear. None of this should come as a surprise. The Trabocchis have become DC restaurant royalty. 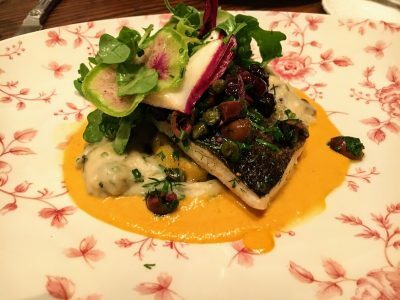 Fiola and Fiola Mare have set the standard for luxe Italian in town, with sky-high prices to match (Fiola Mare has also become one of the buzziest places in DC to see-and-be-seen). Casa Luca, ostensibly the couple’s more “casual” spot, has seen its entree prices creep into the $30-$40 range as well. So the idea of a Trabocchi outpost where you could tuck into a bowl of one of Fabio’s terrific pastas without breaking the bank was bound to be a huge draw. But equally important is Sfoglina’s location. 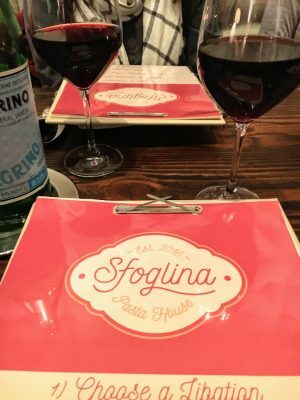 The Trabocchi’s didn’t open Sfoglina in Shaw or Barrack’s Row or Georgetown. They opened it in Van Freakin’ Ness. Van Ness is one of those neighborhoods that for some reason has been vastly underserved by the restaurant community. Just compare it to vibrant restaurant scene in Cleveland Park, one short metro stop away. Cleveland Park lost Palena and barely missed a beat. Van Ness lost a Schlotzky’s in 2009 and still feels the sting. 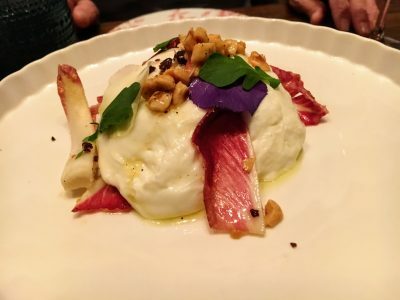 This burrata was so fresh that the outer shell of solid mozzarella hadn’t had time to firm up into a distinctive layer, which made it feel more unified with the interior core of stracciatella and cream. The drizzle of olive oil rather than a sauce highlighted the clean flavors. The one discordant note was the hazelnuts. I want richness and creaminess from my burrata; the only crunch I want is the cracker or bread or cracker I spread it on. 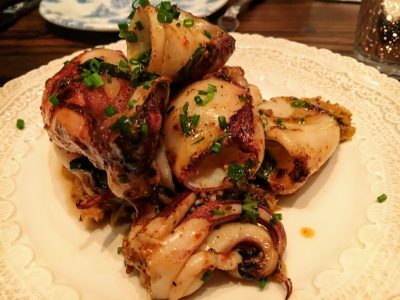 These were beauts — impeccably fresh calamari that pick up smokiness both from the grill and what tastes like a hit of smoked paprika or red pepper, sitting atop a lovely Romesco sauce. 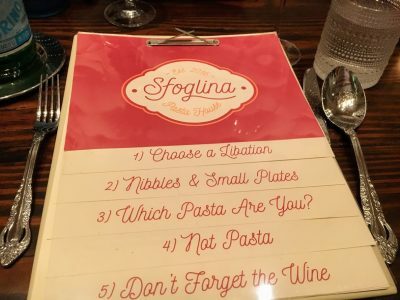 I’m guessing that Sfoglina benefits from whatever fishmonger supplies Fiola Mare because the seafood throughout the meal was second only to the pastas as a reason to return. Some may find this soup a bit dull. I found it simple and soothing, a peasant dish with humble ingredients like eggs, chives, and parmesan in a slightly lemony broth. 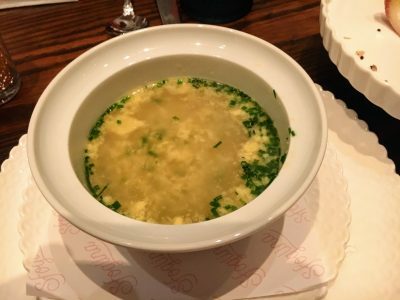 Sort of like a Greek Avgolemeno (egg-lemon soup) cooked in the style of a Chinese egg drop soup with a stiff hit of parmesan. Unfortunately, while the streghe work fine for dipping into the burrata or the soft ‘Nduja Salami, when there are sop-worthy sauces on the table like the pastas below, I found myself craving some soft, crusty bread. 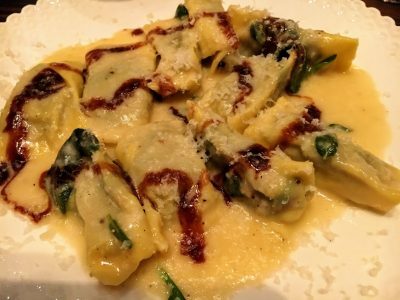 Pastas are divided into two categories — Classics for $22/plate and Seasonal for $25/plate; you can also get any three pastas served family-style for $65. Very good rendition of the classic dish with a couple of tweaks: the substitution of pancetta for the traditional guanciale and the use of Fossa cheese for pecorino. Neither really changes the flavor profile. I could have used some red pepper flakes to provide some kick; be sure to ask for some if you like a little heat. A friend of mine says she always orders filled pastas at restaurants because it’s something she’d never make at home. I was thinking how true that is when I ate this dish. 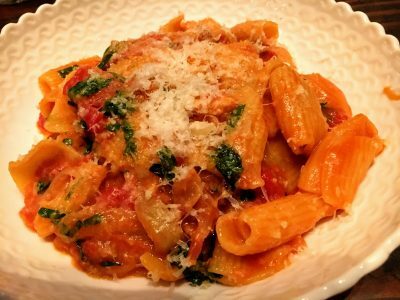 I’d have an outside shot at coming close to replicating the Rigatoni Amatriciana but I couldn’t make this. Rolling out the supple, delicate skins would be hard enough. Wrapping them around the braised beef and chard in perfect little packages would be impossible. I can’t even wrap a decent birthday present, and there I get to use half a roll of Scotch tape. Probably the dish of the night. 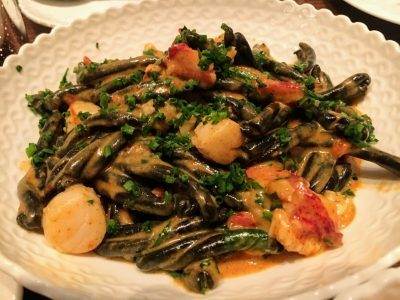 Beautiful squid ink pasta and perfectly-cooked lobster and scallops tossed with a creamy, tomatoey sauce. This is where some sauce-sopping bread would have some in handy. More impeccably fresh and well-cooked seafood. There may be too much going on with the rest of the plate, however, with various elements fighting for attention and never really coming together. But the branzino and potatoes are so good together that the extra elements can be overlooked. The only real disappointment of the evening. 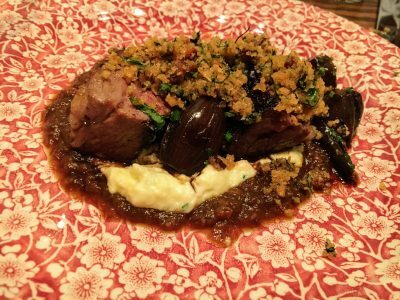 When I saw short ribs with polenta on the menu I imagined a comforting bowl of polenta adorned with softly-braised meat. Instead, I got a plate with a polenta schmear topped with a couple of short ribs cooked more like a medium rare steak. It wasn’t that bad. It just wasn’t what I wanted and not worth $27. 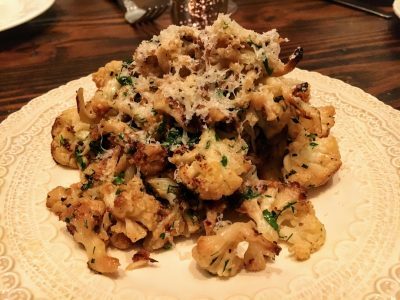 Cauliflower is having its moment. Which is why I’m still surprised that so many places don’t know how to cook it, sending out still-crunchy florets that would be more at home on a crudite platter than a dinner table. Sfoglina gets it right. The florets are cut small, making them easier to cook through, and the touch of chestnut cream and tang of pecorino provides some oomph. 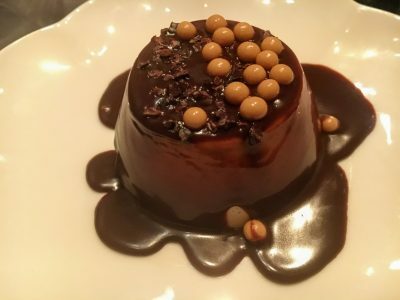 This rich and creamy budino (pudding) is a good way to top off the meal. It’s billed as white chocolate but whatever makes it “caramelized” leaves its flavor somewhat indistinct but still delicious. I also hear good things about Nonna’s Lemon and Hazelnut Cake (I mean that literally; the women at the next table ordered it and I overheard them talking about it). Summary: Pastas are the star at Sfoglina so build your meal around them. But remember they aren’t super-sized portions. When you’re looking for something to supplement, you can’t go wrong with anything that swam or crawled in the sea. Hopefully they will keep the quality up and the prices down. The good people of Van Ness deserve it. Logistics: You can make reservations online at Reserve.com up to 90 days in advance. If you’re driving, you can try street parking or there’s a new public parking garage just south of the restaurant entrance at 4445 Connecticut Ave NW. Metro is also convenient with the red line (Van Ness stop) about a block away. This entry was posted in Articles, NW, Restaurants DC. Bookmark the permalink. I love this place. I hope it stays affordable! 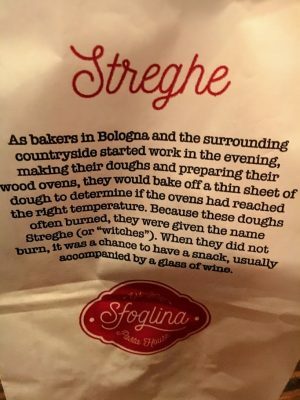 I’m a pasta cook at sfoglina and I appreciate everything you’ve said! 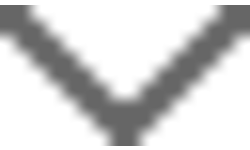 You’re always welcome back!